I had been asked to memorize my speech and I struggled with this. I am not a person who has the gift of memorization. I am a great extemporaneous speaker and a good manuscript preacher. The request to memorize caused me great anxiety. During my run through, my dear friend, the Rev. Dr. Andrea Walker reminded me that I was being asked to tell my story…and I know my story. So, what you see in this video is not what I had prepared. Below you will find my prepared remarks, which tell the same story that I shared in front of those gathered but also include some details that my mind skipped over. I’m convinced that what I shared publicly was what God intended for me to share. But I am a writer and I wanted to share my written reflections with you as well. May you always remember that you are not alone. I’m going to get straight to the point. I am a divorced, 33 year old black Puerto Rican who is 3rd generation Lutheran. I was baptized and confirmed in this church. I worked at camp in this church. I went to seminary in this church. I am a woman in leadership in this church. And I also live with depression and anxiety. I take 40 mg of Prozac, .25 mg of Xanax and vitamin D supplements daily. Medication is non-negotiable for me. If I don’t sleep for at least 8 hours a night, things start to unravel. If I don’t see my therapist regularly, my mind goes to dark places. I’m here to share with you my story of being a person of faith who lives with depression and anxiety. To anyone here living with any type of illness, there are three things that I want to make sure you know before I leave this stage. 1: You are loved and worthy. Your identity is steeped in who God is – not in what you’ve done or what’s been done to you; not in the diseases you have; not in what people say about you. You are a child of God, fearfully and wonderfully made. 2: You are not alone. 1 in 10 young people suffer from a diagnosable mental health disorder. Nearly 80,000 young people suffer from severe depression. Between 1 and 15 young people deliberately self harm. 3: You have to embrace the fullness of who you are. I’ve come to learn that my depression and anxiety are a part of me. They are my shadow side and they go where I go. Instead of running from my shadow, I’ve learned to embrace it. I always knew that something was…off… not quite right… The mind is a powerful thing. There was always a still, small voice that whispered in my ear, “Rozella, you will never be good enough. You are a fraud. When people know and see the real you, they won’t love you.” I never felt like I fit in or belonged. I always felt like an outsider. I’m sure this had some root in my biological parents separation and my mother and stepfather’s divorce. It probably had something to do with the molestation and other taboo behavior that occurred within my family. There were times I can vividly recall being so sad for no tangible reason. I couldn’t breathe. The sadness overwhelmed me and I struggled to find my way back to the surface. I often wondered if life was even worth living. For so long I lived with self-loathing, shame and anger. This affected every decision, relationship and job that I had. I sought refuge in men and alcohol and marijuana. The goal was to not feel. To not think. To not care. My life was falling apart. I failed out of college after my junior year. I should’ve sought professional help at this point. I could’ve begun the process of healing while learning to live with my mental illness. I didn’t do that. Shame engulfed me. The worst was when my husband and I separated. My grandmother died. My father was sick. I was in an unhealthy work environment and was crushed by the weight of it all. I couldn’t get out of bed. I began to isolate myself. I slept all the time, telling people I was working from home. I didn’t clean, eat or bathe. I hid from everyone. I lost three months of my life and I honestly don’t know where they went. I hit the bottom below the bottom. And that’s when the healing began…My friends recognized that something wasn’t right with me. I was called out and surrounded by a loving community that wouldn’t take “no” for an answer. And you know what? This was painful. To be this vulnerable and to say that I needed help terrified me. Quite frankly, I was afraid of what people would think. My church community helped develop a plan of care that included finding a therapist and helped me pay for her services. My physician, working with my therapist, put me on a course of closely monitored medications. I came clean with my family and I came clean with myself. I embraced my reality of being a young, single black woman who struggles with depression and anxiety. I know that mental illness will be a part of my life. But it’s not all of my life. God’s grace has taught me how to embrace my shadow. 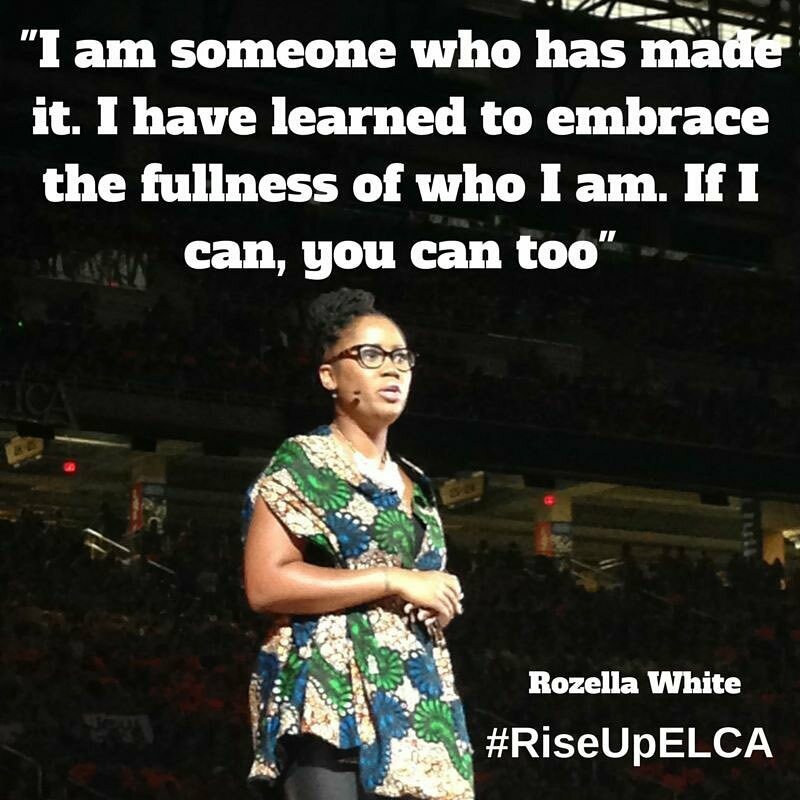 So today, I stand before you, not as one who doesn’t struggle but as one who has embraced the fullness of who she is. And you know what else? God loves me – unconditionally. I can’t help but to break the chains of stigma, secrecy and shame when it comes to mental illness. I am called to make sure everyone I encounter knows that they are loved and worthy and enough. God’s movement in my life compels me to make sure that you know that you are not alone, that we serve a God who has promised to never leave us. God is for us and nothing can separate us from the love of God in Christ Jesus. Can I get an amen! It’s my hope that you know that you are not alone and though all seems hopeless to remember that someone made it. And you know what that means? So can you. This entry was posted in Depression, Faith, Life and tagged Christianity, community, Depression, faith, Healing, Hope, Survival. I love you and will never forget your smile as you told your story and touched the hearts and lives of so many. I was at Ford Field that night and heard you tell your story. Although I was familiar with it from having read your blog, it was powerfully compelling to hear it straight from your heart and voice. May God’s grace continue to mold you, fill you, and use you to be a source of encouragement to those who struggle with mental illness. You are an inspiration to many. Blessings! thank you for sharing your story. you are wonderful and such an inspiration!!!! I was at the youth gathering, and I heard every word of your presentation. I, as a fifteen year old, found many points of your story relatable, in that moment I felt like you and I were the only people in that field, and that you were speaking directly to me. I got very quiet for the rest of that night, I needed time to process my feelings and thoughts. A month later and I’m still not sure how I feel and what I think about my situation. But you really opened my eyes to see that someone could go through so much, and still become an amazing person in the long run. You have no idea who I am, but I learned so much from you that night.